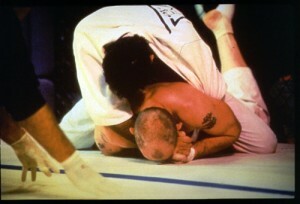 Gerard Gordeau, a Dutch savate master, held many accolades upon entry into UFC1. Gordeau was the 1991 Savate World Champion and holder of 8 consecutive Dutch Kyokushin Karate championship titles. Gerard became engrained in UFC history for his fight against Teila Tuli in the first round of the Ultimate Fighting Championship bout on 12 November 1993. Gordeau’s Ultimate Fighting Championship match with Teila Tuli lasted only 26 seconds and was stopped after Gordeau knocked out three of Tuli’s teeth with a kick. The event announcers exclaimed that a tooth had landed underneath their table, the other two were embedded in Gordeau’s foot for the remainder of the show, due to the UFC doctors not wanting Gordeau to have an open wound in his foot. Gordeau also broke his own hand on Tuli’s head after the kick. Despite the injury, he fought twice more that night. After winning his second match against Kevin Rosier, Gordeau faced Royce Gracie in the championship bout. During the bout, while Gordeau was locked in a clinch with Gracie, he bit Royce’s ear in an intentional foul. Despite the foul Gracie still managed to submit Gordeau to win the fight, the tournament, and the title of the Ultimate Fighter!